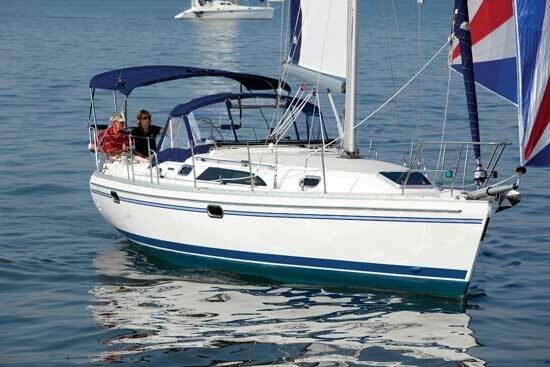 The Catalina 275 Sport packs a lot of value and performance in a small, easy-to-manage sailboat. A clear trend emerged at the last U.S. Sailboat Show in Annapolis, MD, last fall: Small is beautiful. 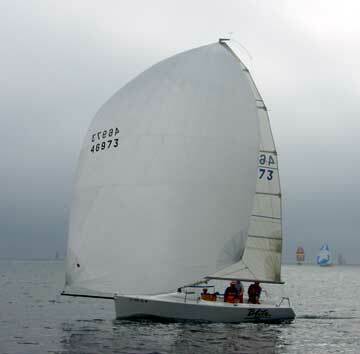 Smaller, less expensive, and easy-to-sail boats filled the slips and show goers took notice. The industry seems to have realized that not everyone can afford or even wants to sail a 50-foot boat, so the under-30-foot selection was well-represented. Among the multitude offerings was the Catalina 275 Sport, designed by Gerry Douglas and built by Catalina Yachts. 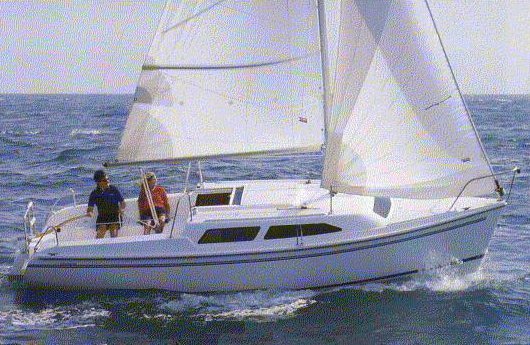 Part of Catalina’s Five Series, this boat was created to be affordable, fun, and oh-so-easy to sail around the buoys or to weekend anchorages. It beckoned, promising nothing but excitement. 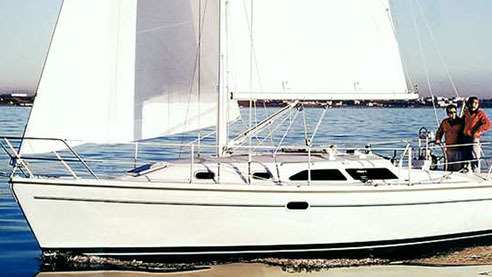 The Catalina 275 Sport glides along gracefully in a light breeze. For ultimate flexibility, the 275 Sport is trailerable so you can tow it to your favorite beach or lake. With a beam of just eight feet, four inches, you won’t even need a special permit. Catalina’s build quality is evident throughout this entry model and includes a hand-laid fiberglass hull, a one-piece resin-infused deck, and a five-year warranty. Catalina’s famous “Strike Zone” forward impact bulkhead is present as well. The Catalina 275 carries a single-spreader, 15/16ths Selden rig with a deck-stepped mast that rises 39 feet above the waterline. 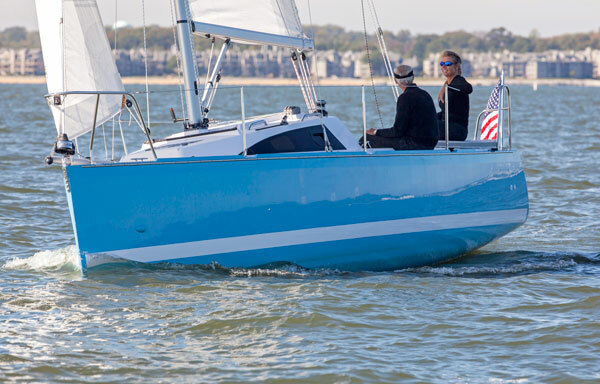 The standard keel is four feet, five inches deep, but an optional three-foot, five-inch keel is also available. 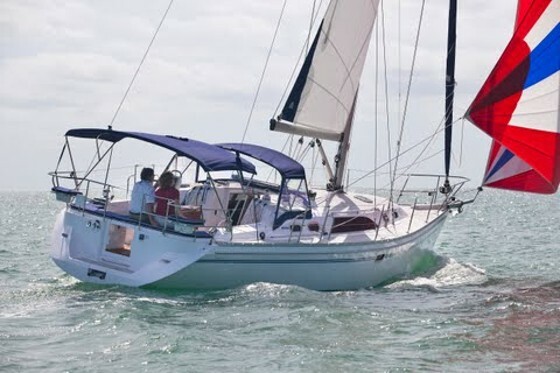 The fully battened mainsail has slab reefing, and the self-tacking 90 percent headsail has a traveler mounted just forward of the mast. The sightlines forward are good, and the extension on the carbon tiller makes it easy to hike out and get an even better view. Everything is small and easy to manage, so the boat inspires confidence. 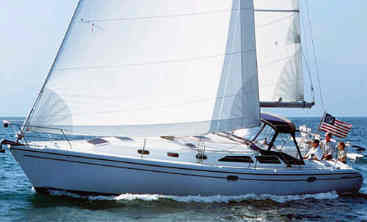 The Catalina 275 Sport's cockpit dominates the length of the boat and has lots of room for sailing, racing, and relaxing. Douglas’ emphasis in this design was on the cockpit, which dominates the length of the boat. Boarding from a dinghy is easy at the open transom, where an integrated ladder also provides access directly to and from the water. The cushions are designed for the seats and the upper side decks so you can sit comfortably higher with a better view of the headsail. The cushions even overlap and cover the center track so you can stretch out in comfort when lounging in the cockpit. The mainsheet traveler divides the cockpit and integrates two swiveling cup holders. When perpendicular to the traveler, Douglas jokes they’re in cruising mode, and when tucked neatly next to the traveler and out of the way, they’re in racing mode. 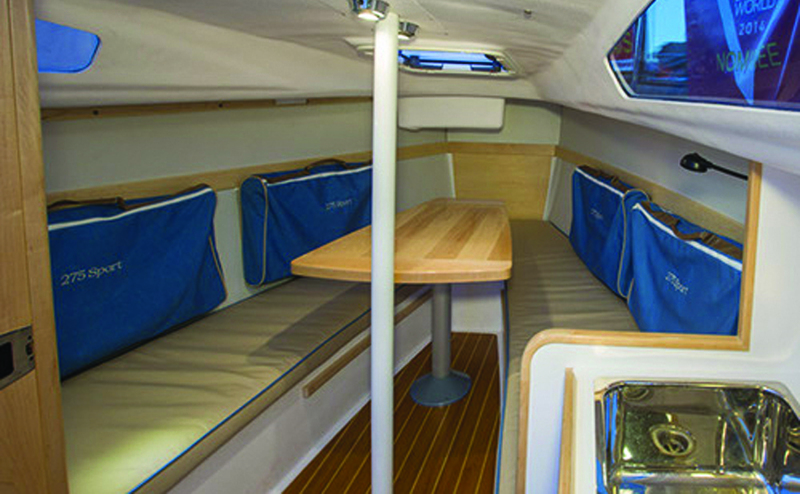 Below, the Catalina is loaded with amenities that are unexpected for a boat this size. To starboard is a compact galley including a sink with manual water pump and one-burner butane stove. A huge pullout drawer holds a cooler that you can fill up at home so your “fridge” is packed before you even get to the boat. A cutting board is integrated into the stove top cover so a sous chef can work on the salad or have extra countertop space. Dishes can be stored neatly in an included cubby space. To port is a fully enclosed head/shower combo with a manual toilet and sink. Forward are two six-foot, five-inch long berths that double as seats around a drop-down table. Aft to starboard is a second berth long enough to store a stand-up paddleboard (SUP). The interior finish is white with maple trim that can be accented with LED lighting at night. Solid wood is part of the quality of the interior just like on Catalina’s bigger models. A unique feature I noticed are zippered stowage bags into which you can pack your clothing and necessities; they slide into tracks along the hull sides to form instant storage “lockers.” You can’t ask for an easier way to get your kit down to the boat or a neater way to stow it. 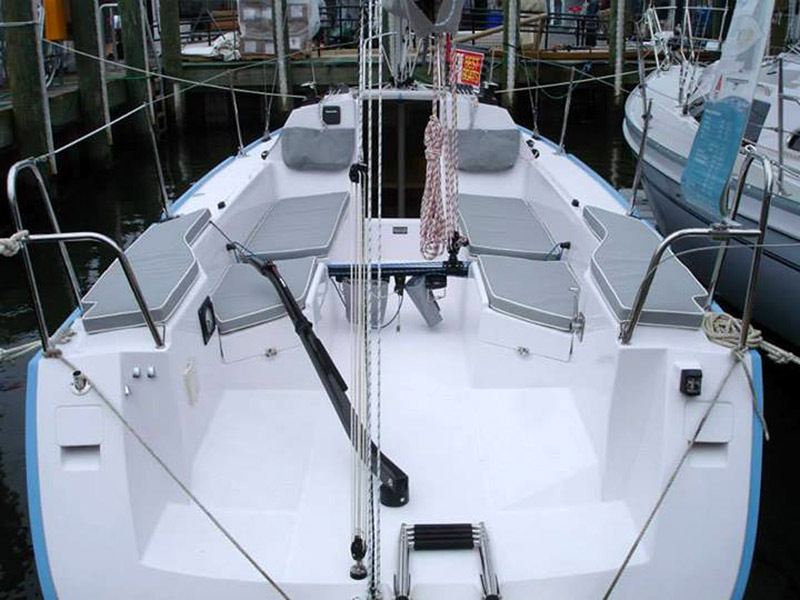 Versatile below-decks spaces include unique zippered gear bags for crew, a large dinette, and a galley. The aft section to port is for storage and accessible from the cockpit. You can stow lines, fenders, the cruising chute, or anything else that needs to go into the “garage” here. This tiny sport boat even comes with a 14-horsepower inboard Yanmar diesel with Saildrive. The engine is neatly tucked under the companionway steps, just like on big boats. Speedy sailing in a light bridge makes the Catalina 275 Sport fun. 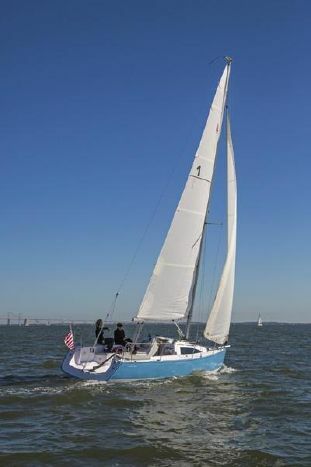 Our test sail took place with calm water conditions on Chesapeake Bay. There was a variable breeze that rarely topped eight knots. We slipped along at 5.5 knots in eight knots of apparent wind at 45 degrees. When we fell off to a broad reach, we still carried four knots. It was hardly a fair test, due to the conditions, but I got the idea. In 12 knots of true wind, the 275 Sport would be a kick—even singlehanded. We were by far the only test boat out there moving that day with any consistency. That provided even more emphasis on why small is smart. The hull is U-shaped down to the fin keel and then becomes more full aft. Although we didn’t have a chance to test it on in anything lumpy, Douglas says the hull shape will make it less likely to pound to weather in a choppy seaway. While we hunted for wind, Douglas got out the Doyle APC spinnaker on a top-down furler and attached it to the retractable sprit. This setup is an option included in the performance package. With its loose luff, it couldn’t have been easier to set or control and we glided easily downwind. When the wind died altogether, we turned on the Yanmar 15-horsepower diesel and motored back to the slip at nearly seven knots. Draft 4' 5" or 3' 5"
Sail Area 380 sq. ft. According to Douglas, the design goal was to create a cross between a J-80 and an Alerion 28—a boat to be day raced with five friends or cruised for a weekend by a couple. I can easily see myself spending a long weekend on the Sport 275 and because it is all so easy to manage. That’s not something I’d usually contemplate with a 50-footer, if for no other reason than the effort exerted to weigh anchor, hoist a giant sail, and then hope for a fresh breeze. Now, add to that a starting price of $75,000 (the performance package adds another $2,000) and this boat suddenly starts to make a lot of sense. It doesn’t matter whether you’re trading up to a more comfortable platform, or down from a complicated cruiser; the Catalina 275 Sport seems to be hitting a sweet spot in the current market. Its stylish design, affordability, and myriad clever details will fill the bill for those looking for simplicity. Oh, and lots of fun. 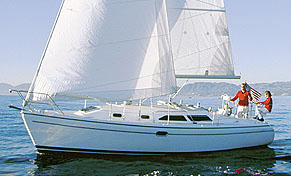 For more information, visit Catalina Boats.